I’m just starting the 3rd year of my PhD at St. Andrews. I am interested in the evolution of sexual traits and how these affect species ecology. My working title is: Investigating the causes and consequences of reproductive interference in the Lygaeidae. Reproductive interference (or RI) is when individuals of one species engage in reproductive activities with individuals of another species, and these interactions reduce the fitness of one or both species. These reproductive interactions can be anything from interfering with sexual signalling, for example the calls of one species of frog masking those of another, to actual attempts to mate with other species. 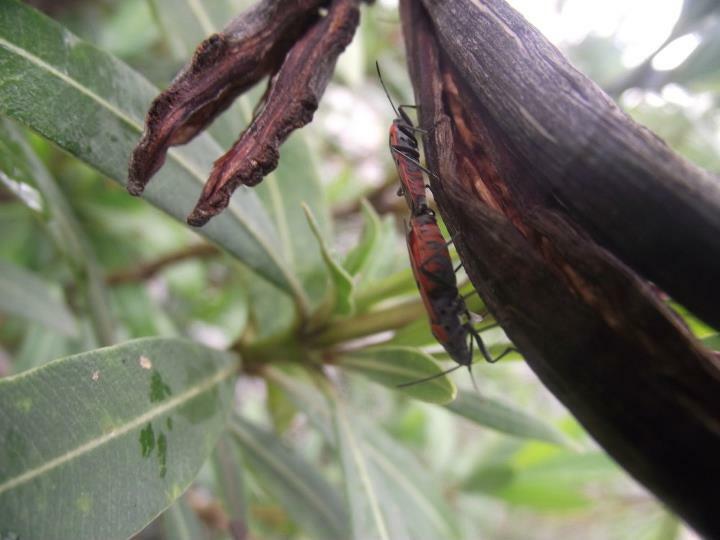 The Lygaeidae (commonly called seed bugs) are a family of true bugs found worldwide. My work focuses on five species collected from Europe and the USA. Thus I can study interactions between species that naturally co-exist in the wild as well as those who would normally never encounter each other. What causes animals to mate with the “wrong” species? In order to answer this question I am looking at the effect of context and previous experience on mate preferences. I am also investigating a possible role of circular hydrocarbons as inter and intra specific signals that could be used in mate recognition and mate choice. What are the fitness consequences of reproductive interference? So far I have looked at the effect of harassment by heterospecific males on female seed bugs. I am now looking at how males change their mating strategies in the presence of heterospecific males.